One of the areas in the Personal Development Quarterly Planner that changes weekly for me is the "Daily Habits to Foster." This is the area where you can track daily activities that you want to make habits. How do you use this area? Are you seeing an improvement in your daily activities? I love paper. Paper books. Magazines. Fancy pens to write on paper. Post it notes. Spiral bound notebooks. Legal pads. All things paper! I wrote this blog post out on paper before I typed it out for the blog. ​When I was a kid I would practice my handwriting for hours. As an adult now my handwriting often gets mistaken for typed fonts in my planner. You have heard the saying "Practice makes perfect," and practice has certainly helped my handwriting. However, I am not a perfectionist; as I believe done is better than perfect. ​We took our kids to the book store yesterday and I absolutely love taking in all the new and exciting things found there. I love showing Livia all the information that is at her fingertips. Sure, YouTube is great, there is so much information there... BUT nothing beats the information you can find in paper books. Paper makes things so real for me. ​At the bookstore I actually found a magazine on paper. It was all about the love of paper, textures, cutouts, and activities; so I know I'm not the only person who loves paper! ​My printer for the planners email signature reads "P.S - It is okay to print this email. Paper is a biodegradable, renewable, sustainable product made from trees. Growing and harvesting trees provides jobs for millions of men and women, and working forests are good for the environment, providing clean air, clean water, wildlife habitat and carbon storage." ​I love the feel of paper. I love having all my thoughts out of my head and onto the paper. I understand digital has its place. After all, our new sister company is Websites Managed and we sell our paper planners online. However, I don't think we will ever fully replace paper with digital. ​What are your thoughts on paper? The official week of planning! This week is the official week of planning (according to me)! You are the project manager of your life! Taking the time between Christmas Day and New Year 's Eve to plan for the year is a great use of time. Many people take this time off to recoup from the holiday season. I think taking the time to play project manager of your own life is really important. Get a notebook - I prefer a planner with lots of notes pages - and get your thoughts out of your head. Create clear, defined, and attainable goals for the year, the quarter, the next month. Break down goals into action steps you can take. Create reminders (I use sticky notes) so you look at your goals daily. Defined Goal: Pay off x credit card with x balance with tax return. Pay off x medical bill with x balance with bonus in July. Pay off x with x balance by paying x monthly. Erasable pens and highlighters! I love to write in pen and these save me having to carry white out too! Friction is how they erase. Give them a try... you will not be disappointed. Transparent sticky notes are awesome because you can still see what is underneath in your planner... just give you some extra room for temporary notes. Magnetic bookmarks so you can easily flip to the current month or week view. It is time to start taking your schedule seriously. I don't believe the tiny calendar on your phone is taking your schedule seriously. You can only see one day at a time. If you are on the phone trying to set an appointment it is awkward at best. Most people are not tech savvy enough to use the calendar on their phone 1/10th as effective as our basic quarterly planner. The principles used in developing the Time Managed planner are based on personal development practices that have been in use by highly effective people for ages. We take project management principles and give you a blueprint to help you reach your full potential. See other features based on specific planners. Lessons in time management are a waste of time. You already know what to do. So do it! It's May... Why would I buy a planner? Believe it or not... people buy planners year round. The busier times of year are back to school and at the beginning of the year. The other times that we are busy are at the beginning of each quarter (we sell quarterly planners) and whenever one of our network marketing companies has a conference (people are excited about their goals/dreams). So why should you buy a planner in May? Are you on track to reach your goals this month, quarter, or year? A planner is a great way to help you stay on track; daily. It is the daily action that you take that gets you closer to your goals and if you are not focused on your goals then you are standing in your own way. Accomplish lofty long term goals by thinking on a shorter term basis. One of our quarterly planners is a great way to stay focused on your goals. Another great tool to help you focus on your goals is our top three goals sticky notes. New format for 2017. There is a daily area for focus, top six tasks, and time slots. There is a daily habits to foster checklist area, and areas for gratitude, top three goals, and projects. It helps you keep everything in front of you at a glance. This is the original format; most of our planners still have this week view. There is a daily area for focus, top six tasks, time slots, and incidental tasks. Use a sticky note to keep your top three goals in front of you with this week view. All of our planners have an inspiring quote with each week view and are fill-in-the-date (unless otherwise stated) so you can start anytime. Look at planner details for other features like notes between the weeks. If you want to accomplish your wildest dreams write your goals down and look at them every day. Ubiquitous (adjective) ​present, appearing, or found everywhere. There is not business (at least that I can come up with) that does not require time management. All businesses whether service related, products based, or in technology have some element of time management. The attorney has to keep track of time so they can bill their clients. The retailer has hours they are open. The software developer has timelines and the stock broker can make many trades in the seconds between your trades. How do you currently manage your appointment book? Task list? Time Managed can help you streamline your life and grow your business. What are your goals for this quarter? Next 6 months? We want you to think on a shorter term (quarterly) basis in order to accomplish those lofty long term goals. Leverage your time and get more done! In order to be more present in life, it is important to clear your mind! We encourage people all the time to "Get it out of your head." You should not be having the same thought twice! The act of writing things down helps your brain to process information as well as frees your mind to have creative thoughts. It is proven that when you write things down that you remember more! It is one thing to write everything down on post it notes, or to have three different notebooks in various locations. We want you to have one place to put EVERYTHING! Our planners have TONS of room for notes so that you can have it all in one place. The quarterly planners have the most room for notes (4 pages between each week) but our Ultimate Annual also has two pages for notes between each week. 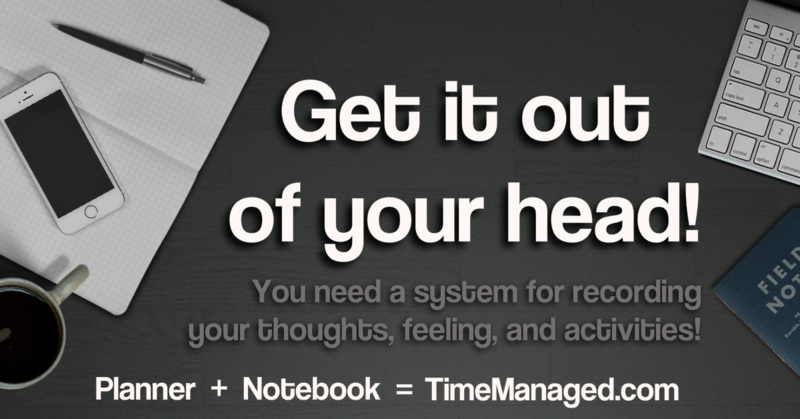 Have a system for recording your thoughts, feelings, ideas, activities, conversations, etc and USE IT! You will find yourself being more productive! Jenny Cerda is a Gold Premier consultant with Perfectly Posh. We interviewed her to get her story and learn how she got to be so successful with Perfectly Posh. This lady has her Time Managed! She says she is always trying to be more efficient. She has been her own boss since 2012 when her son was a year old (he is 5 1/2 now). She worked in higher education for 20 years but when she had her son she know she wanted to do something different. Network Marketing was the perfect social selling tool that she was looking for. She says she loves being her own boss and helping women more than she ever thought she would! Her passion for her business shined through our conversation. Her mantra "we simply pamper" is really how she grows her business. What does a typical day look like for Jenny? Seek not balance but abundance. Dominate your industry - do not try to compete. Read 60+ books per year and attend 6+ conferences (this is what the most successful do). Don't think "either or" but demand "all or everything." And our favorite: JOURNAL YOUR TIME TO IMPROVE! He suggests you log everything in order to improve you have to know where you are spending your time in the first place. This book is available on Audible and we highly recommend giving it a listen! the process of making plans for something. "time to develop a coherent economic strategy"
synonyms: master plan, grand design, game plan, plan (of action), action plan, policy, program. I am often referred to as a "planner" and people tend to think that when something doesn't go as planned that I will crumble. I am changing my personal paradigm to being a strategist. I know that plans change and that I have to be able to accommodate anything that life throws my way. A business plan is really a strategy; full of how to do things the best way. It has to have contingencies because things don't always go as planned. So, I want to ask you: Do you have a plan or a strategy? He emphasized that they need to be in that order. To accomplish anything you want you need to love knowledge, create strategies, and then execute. There is so much to do! Life can be overwhelming! Many people struggle with how to get everything done. Then there is this idea that we need work/life balance (in our opinion there is no such thing). We have goals and aspirations; then the daily grind gets in the way. 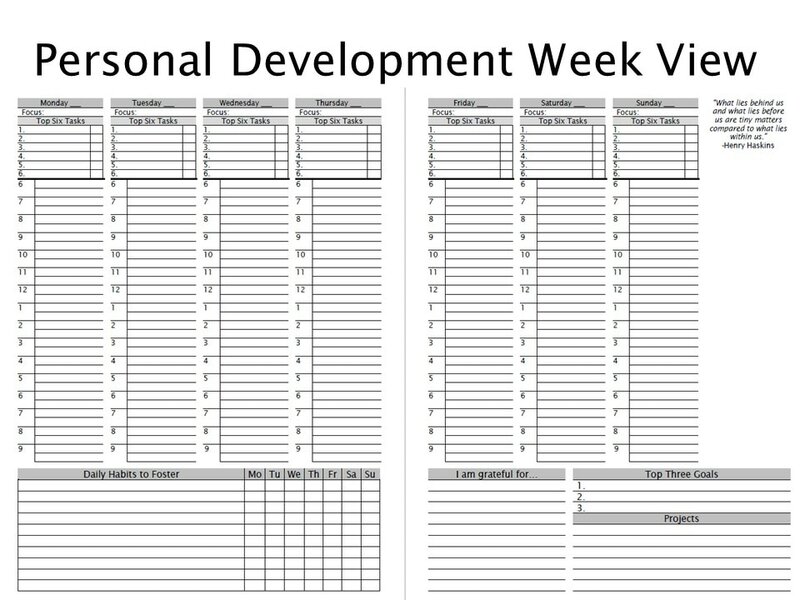 Here is where we introduce the ideal week exercise... designed to make you feel good about your schedule and time management. It is an exercise to make you realize that it is all possible (and if it's not then you need to delegate). 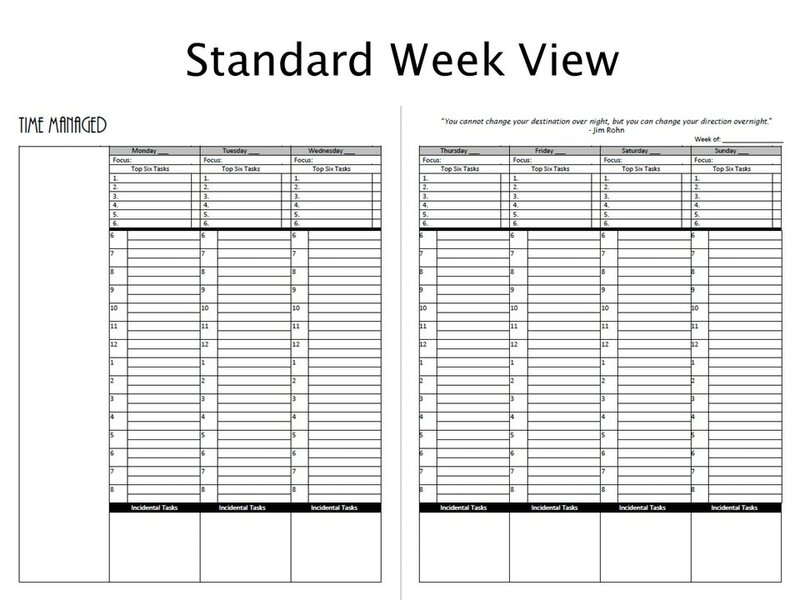 I use one week out of each quarterly planner in order to perform this exercise; but at the end here I have provided a blank set of pages for you to use. On a blank sheet write down everything that you would typically need to accomplish in a week. Write down everything that you want to spend your time doing. For example, don't just write down what you need to get done at work but date night, laundry, cooking dinner, exercise, helping kids with homework, finances, etc. Pick a color for each of your primary activities (group them); we also call this your four vital functions. For example, day job, network marketing, family/personal, and whatever else. Maybe you just have your business and your colors could be for marketing, finances, operations, and personal. The idea is that the colors show you where you are spending your time. Write the each of the activities you came up with in step one into the time slots. Use the highlighters to block out time for things that last longer than 30 minutes. If everything you need and want does not fit in the schedule then figure out what you need to delegate and make it happen! Don't leave things to chance. How often does someone have to do something over because they didn't listen the first time? If you have kids then the number of times that comes to mind is greater than the average. There is an under-appreciated value in listening skills. When you listen to someone at a party and ask relevant questions you will likely be viewed as a great conversationalist. When you do most of the talking you will likely view the other person as a great conversationalist. Why is such value placed on listening skills? We think listening is valued not only because people want to be heard, but because when you listen, time is saved. You save the person from having to repeat themselves. You save yourself the time of researching something. If you listen with intent to understand you gain valuable knowledge about the person you are interacting with. The customer that you listen to with intent to understand; you are better able to help solve their need.. The employee you listen to to understand; you are better able to lead because you know where they are coming from. The spouse you listen to with intent to understand; you are more able to communicate with. Take time to hone your listening skills... Listening is a crucial part of good relationships. "Most people do not listen with intent to understand. Most people listen with intent to reply." Conference call training is FREE and open to anyone with a Time Managed planner. Contact us if you would like to schedule a training.